The purpose of a fire extinguisher is no secret. It is used by trained individuals in a bid to tackle a small fire whilst other people are escaping the scene. Their presence is the workplace is governed by law which means that every single public building throughout the United Kingdom is answerable for ensuring they are indeed onsite and in the right locations. 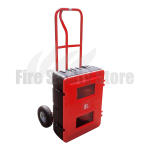 Extinguishers come in all shapes and sizes for various different reasons and specifications. 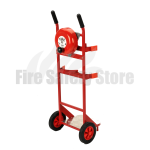 Most small extinguishers are easily manageable to be carried from one point to the other depending on where they need to be sited. Sometimes though, companies may have larger extinguishers that need shifting. They may even have multiple pieces of equipment that are too heavy to be shifted simultaneously by hand. Of course, there are many different ways to move heavy and bulky equipment already in operation around a great deal of workplaces. 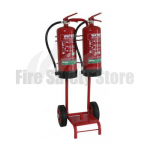 These are fine for moving most things but the sometimes awkward rounded shape of fire extinguishers mean they can roll around and fall off of pump trucks and trolleys, potentially causing undesirable damage to the canisters. 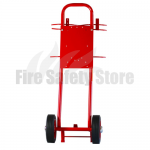 Therefore, the most suitable apparatus for transferring extinguishers is a dedicated fire extinguisher trolley. 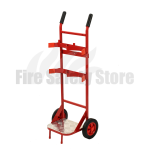 Fire extinguisher trolleys allow you to have mobile fire points and to move fire extinguishers to areas where you might need them. They are particularly useful for workplaces such as temporary construction sites, warehouses, factories or petrol forecourts where there is a lot of activity. 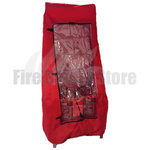 Alternatively they can be used as a way of moving your extinguishers closer to the source of the fire in any environment without struggling to ferry them to the place they are required. 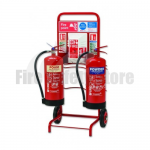 Here at Fire Safety Store, we provide a range of fire extinguisher trolleys with varying levels of use. 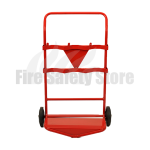 Different trolleys are capable of moving different numbers and sizes of fire extinguishers. 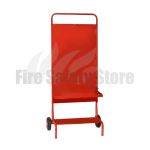 Some trolleys also offer space to carry other fire safety equipment such as fire buckets and signage. Think about your needs before purchasing any trolley to make sure you get the correct one for you. 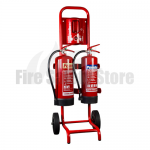 Fire extinguisher trolleys can be fitted with warning devices to alert nearby people that they are coming through. We have rotary bells available separately that can be attached to your trolley and will help increase awareness quickly. We understand the importance of fire safety so if you order before 2pm, you are guaranteed to receive your order the next working day. If you would like to know more or are at a loss as to which of our products will be of benefit to you, do not hesitate to call us right away.